The collection progresses in chronological order, starting in the late Silla Period (around the 9th Century). The early works consist of the few surviving brief tales, bizarre flash fiction featuring ghosts and transfiguration. Next, we move on to the early Koryo Period (918-1392), where the style changes to histories and biographies. The texts featured here are mainly allegorical pieces featuring characters such as Mr. Cash and Master Malt, the focal point of some rather heavy-handed moral lectures. As Korea moved into the Choson Period (1392-1910), the literary culture began to develop more prose, particularly after the invention of Hangeul. The introduction of the phonetic writing system allowed greater diversity in writing, both in terms of genre and in the class and gender of the writers. Examples here include Kim Sisup’s ‘An Account of Drunken Merriment at Floating Jade-Green Pavilion’ (tr. Gregory N. Evon), in which a well-to-do young man composing poems by moonlight encounters a beautiful woman who turns out to be an immortal telling of times past. There are also some interesting family sagas included. In ‘A Tale of Two Sisters, Changhwa and Hongnyon’ (tr. Jongsoo Shin and Peter Lee), the arrival of a mother-in-law causes problems for two young girls (this is a story pursuing justice beyond the grave…) while Cho Wihan’s ‘The Tale of Ch’oe Chok’ (tr. Sookja Cho) follows a man through a life full of wanderings and hardship to the inevitable happy ending. After being provided with a pillow, the woman lay down. Lady Pak pretended to lie down as well but remained alert to her guest’s movements. Presently the woman fell into a deep sleep and then her eyes opened. From them a fireball emerged and rolled around in the room as her breathing echoed throughout the house. Lady Pak got up and opened the assassin’s bag. It contained nothing but a dagger on which was carved the phrase, “Flying Swallow Dagger” in vermilion. The dagger came out of the bag and turned into a swallow, which flew about the room to attack Lady Pak. She sprinkled fiery ashes, whereupon the bird could not maintain its form and fell to the floor. Lady Pak took up the dagger and sat on the woman’s belly. This is just the start. Even when the invaders arrive in the capital in overwhelming numbers, the elegant lady proves to be more than a match for any soldier foolish enough to attempt to invade her home. Amongst the collected stories, there are a couple of extracts from longer works. One of these is The Pledge at the Banquet of Moon-Gazing Pavilion (tr. Ksenia Chizhova), an early-17th-century multi-volume lineage model. In the snippets available here, we meet yet another evil step-mother at work, but this time the length of the novel allows a more nuanced psychological approach. Another work, this time hailing from late in the Choson Period, is the anonymous palace text Diary of the Kyech’uk Year (tr. Kil Cha and Michael Pettid). This one is based on real events and shows the palace machinations that unfold as a prince bent on power aims to remove all in his way. There are a number of shorter pieces interspersed between the stories mentioned, ranging from autobiographies, stories of wonder and some rather bawdier tales, but the anthology finishes up with a trio of famous works from a very different genre. P’ansori, a style of performing narratives in song, is an integral part of Korean literature, and one of the highlights of this collection are the three classic examples translated here by Chan E. Park (which anyone with a background in Korean studies will probably recognise). For example, we have the Song of Sim Ch’ong, the classic tale of a girl whose devotion to her father is unparalleled, to the extent of being prepared to sacrifice herself to help him regain his sight (as I found out a while back, the famous twentieth-century author Ch’ae Manshik produced a version with a rather less upbeat ending). the inspector general spreads his fan and claps his hands. gather like a swarm of bees. “The inspector general incognito is here! The inspector general is here! have been more frightening than this? 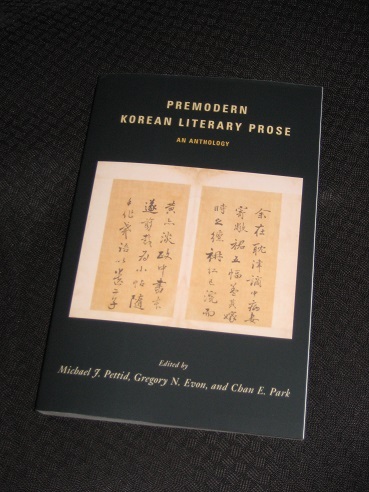 Premodern Korean Literary Prose is an interesting collection, but for several reasons, it’s probably not one suited to the casual reader. There’s a definite focus on literal accuracy in the translation for the most part, with copious footnotes and hanja characters with readings in Korean and Chinese. Combined with an insistence on exploring every possible allusion to classical Chinese texts, this can detract from the reading experience at times. In addition, I couldn’t help but make comparisons with another classic collection I’ve tried, Donald Keene’s Anthology of Japanese Literature. Keene’s work follows a similar structure, yet (for the casual reader, at least) it makes for a far more impressive experience, with introductions to several classics of world literature. After reading the Japanese anthology, I ended up making four purchases, with more likely to follow at some point, but I can’t say that the same is likely to happen this time (and I’m not sure any would be available in translation, anyway).